There are two types of taxi drivers in Dublin, the one who knows everything and everywhere and the one who knows nothing, unfortunately last Friday we experienced the latter. Heading to a relatively new spot on Richmond St. South our poor taxi driver had not got a clue where we were going and was convinced our destination was The Charlemont Hotel … don’t ask! Thankfully we eventually made it to the minimalistic, little red neon sign of Richmond Restaurant in Portobello. Our driver on the way home however was more like a historian as he was able to relay stories from old when he used to end up in the old Gig’s Place with his mates from his band drinking, as he put it “cheap vino and millin a massive fry”, ah memories …. Thankfully not only has owner/manager Russell Wilde put a lot of effort into bringing this building back to life from the serious state of disrepair it had been in for some time but he has manged to transform it completely without it looking out of place in any way. In fact it sits so subtly on the upper echelons of the renowned and revived Camden Mile that you would almost miss it. 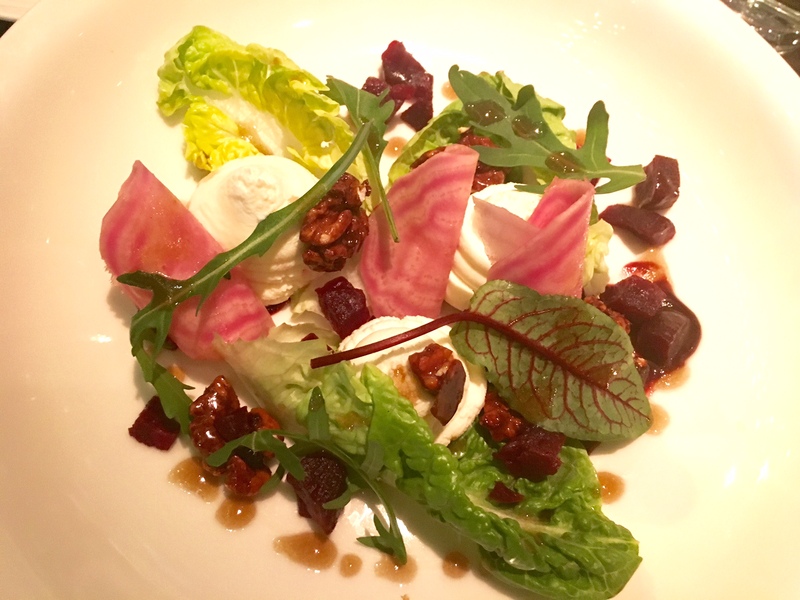 We had dined under new Head Chef David O’Byrne several times in La Mere Zou and Mulberry Gardens so knew no matter what was in store the food would be of a good standard. First impressions of Richmond were good, the warm and easy welcome from Wilde, who has a relaxed charm about him and instantly puts you at ease, this as we found out throughout the night was a common thread with all the staff out front here and we can see how he and O’Byrne seem like a match made in heaven. We arrived with two of our good friends Tom and Jeeny who also know a thing or two about good food and were seated in a comfy raised booth at the window. 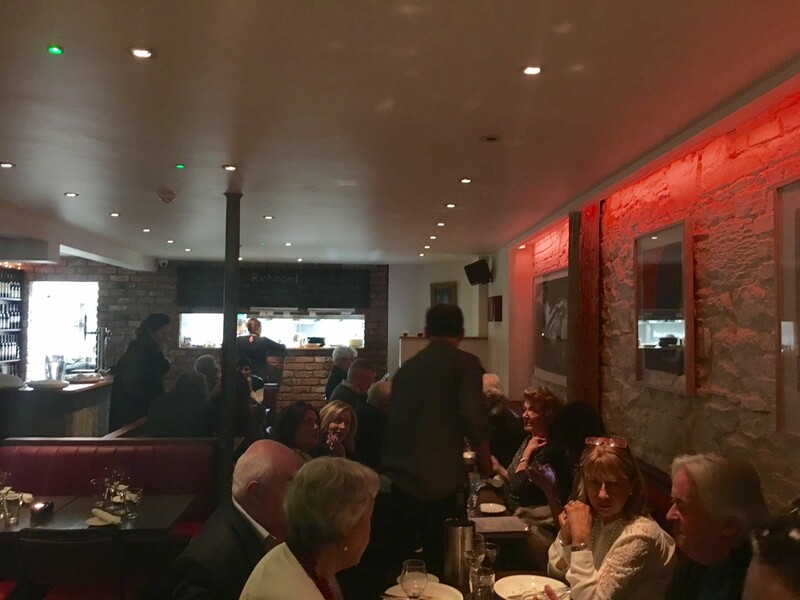 We all agreed we really liked the layout and design of Richmond, they have manged to make good use of a slightly narrow space with simple white washed exposed brick and a hint of red neon reflecting of the wall adding some warmth to the cosy room. The kitchen pass is open and was fairly busy on the night we dined, with O’Bryne at the helm busy plating up all night. There is also a super upstairs space perfect for small parties and an ideal overflow from below with a good view of the street below where you never really know what you’ll see. 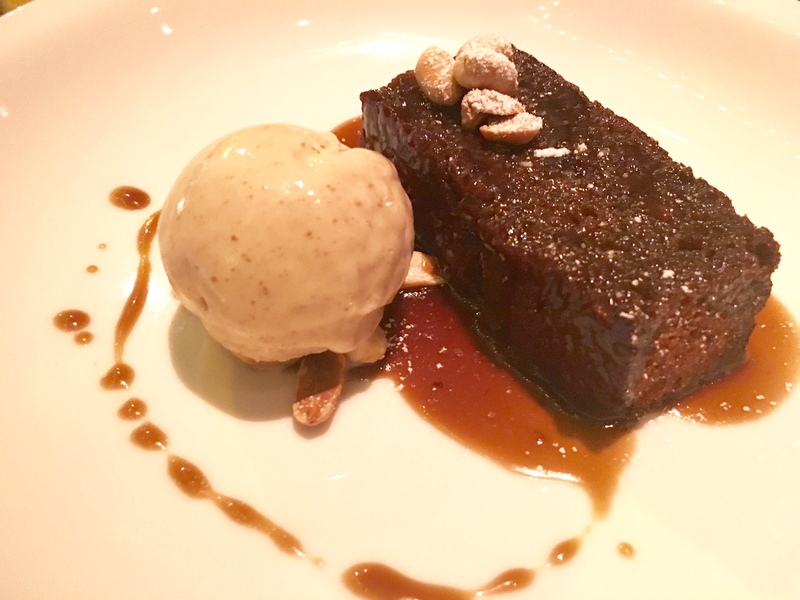 Much like its much lauded neighbours Locks and Bastible, Richmond has a kept the menu short and simple, with four starters and five mains to choose from with a good broad spectrum to please most palates. We liked the fact the menu itself is on a plastic clipboard which doubles up a ruler for those of you who like to measure their portions or just enjoy a bit of a quirky menu like us. We were a little surprised to see a Richmond Burger (€16) headlining the menu all be it one with smoked paprika aioli but given the location is makes sense and judging by the table nearest it was a good call, as three of the four diners had ordered it. We decided to try a mix of most and began with the Ravioli of Smoked Chicken (€8) a unanimously good dish with an old school addition of a shard of crispy chicken skin which reminded us of stealing the skin from the chicken of our Mum’s Sunday roasts unfortunately for mum her chicken skin didn’t taste as good as this. Second starter was a definite favourite with the ladies, Whipped Goat’s Cheese & Beetroot (€8.50), let’s be honest unless you are a really bad chef this dish is damn hard to get wrong. O’Byrne plated beautifully with the three dollops of cheese sitting pretty next to crisp lettuce cups, speckled with a honey drizzle and sweet candied walnuts. This was a simple crowd pleaser and we enjoyed every bite. The Soup of the day was a French Onion (€6) and Tom being a fan decided to resist his much loved scallops and give it a go. 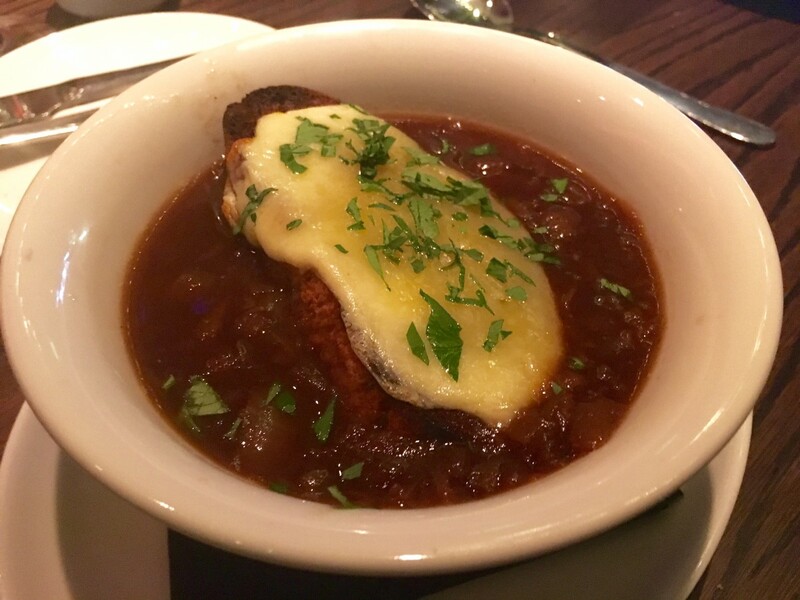 A very rustic bowl of this French classic arrived with melt in the mouth caramelised onions in a rich beefy broth topped off with a crunchy toasted piece of baguette and melted cheesy heaven. If ever there was a soup to nourish the body and the soul this was it. As Wilde took away our dishes asking what we thought, we delved a little deeper into how the venture came about. He explained how Richmond St was not the original venue they had in mind but feels now this was meant to be, with news of two more eateries nearby due in the next two months it looks like he may have made the right decision. As it turns out the food business must be in the blood, his brother and ex sommelier Sheerin has recently opened Avalon in Donnybrook. Nothing like a bit of healthy competition between siblings, no surprise to learn he has helped out with the short but impressive wine list on offer in Richmond with over 19 of the 23 bottles on offer priced below €39, in fact you can enjoy a decent bottle from €24. With several really super options we were swayed by the Heinz W. Gruner Veltliner Kamptal (€37), which definitely influenced our choice in mains. 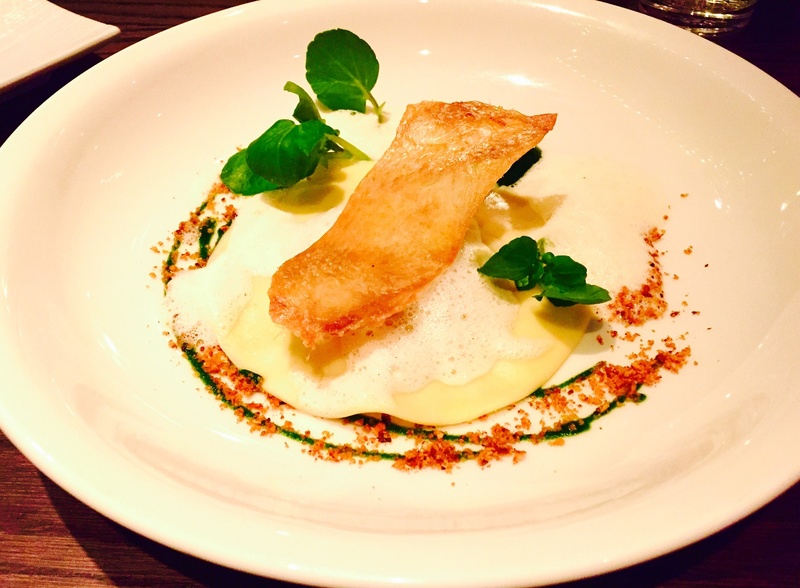 To compliment our aromatic wine we chose the Seared Filllet of Cod (€23) that excelled all expectation, little chunks of roasted butternut squash and chorizo added a delightful texture to the perfect cooked, meaty fillet which was crowned with a luxurious almond cream foam. Our second main of Roasted Breast of Duck (€26) had a lot to live up to and on reflection the clever addition of a sublime little venison pie really made this dish stand out on its own. Three good sized slices of pink duck arrived succulent and tender with the meat rather than the fat doing the talking. The pie was superb and we would gladly order this without the duck, all be it a larger portion. Unusually thin crisps of black pudding were carefully positioned around the duck clearly designed not to overpower the delicate flavours of the pumpkin puree and game sauce. A triumph and two happy campers agreed. It’s always refreshing to see interesting vegetarian option son a menu rather than just a plate of pretty veg. 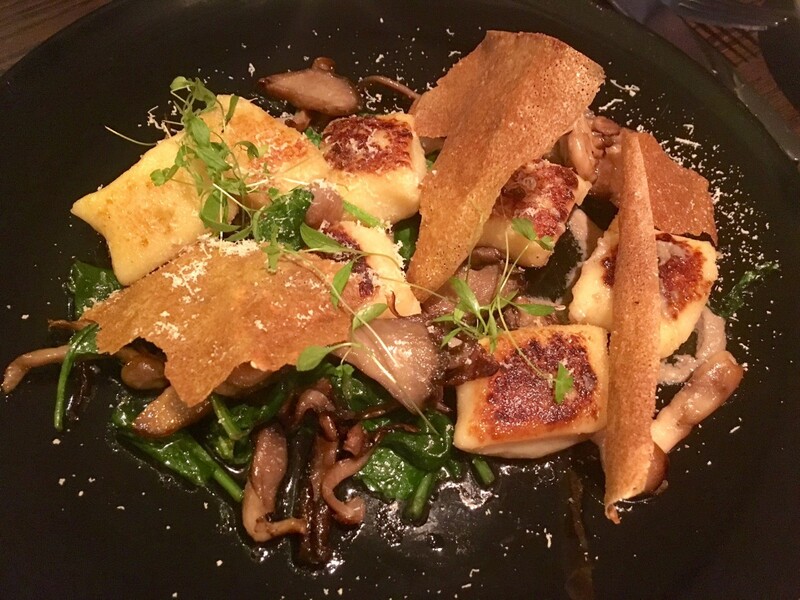 Tom decided he liked the look of the well priced Pan Fried Potato Gnocchi (€16), probably due to the mention of spinach which his love of could give Popeye a run for his money. As it turns out, after we all having a wee sample we reluctantly agreed that is was excellent. The gnocchi was well cooked but the wild mushrooms were the highlight full of flavour and generously scattered throughout. Fragments of brick pastry proved to be a tasty tool in scooping up every last morsel from the plate, always a good sign. Good food, good wine and good company meant dessert was a must. With Rhubarb Compote (€7) and the Dark Chocolate Tart (€8) getting the thumbs down the Date Pudding (€7) got the call up. If you have never had date pudding you haven’t lived and if you have we guarantee it did not taste as good as this. Light as a feather beguiling its appearance; surrounded with a cheeky little dollop of gingerbread ice cream, gooey toffee sauce and salted peanuts. The moans and groans from our table may have slightly alarmed our neighbours but we think it was more of a case of “we’ll have whatever they’re having” moment. 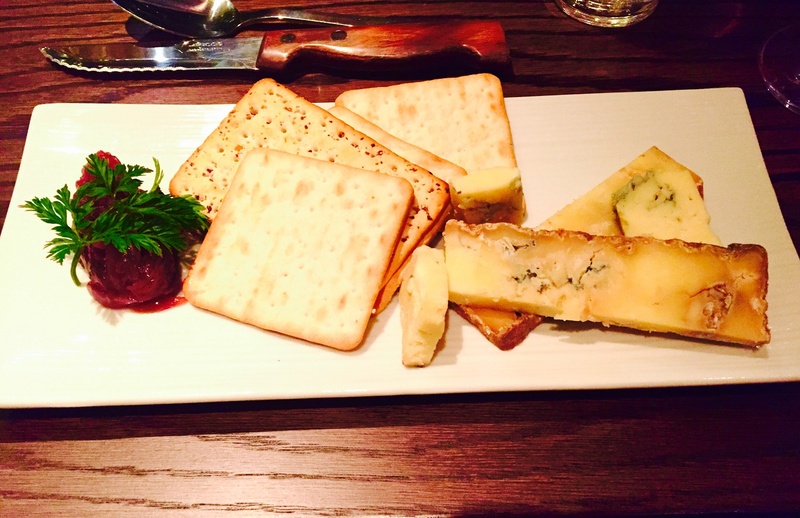 The mini cheeseboard varies depending on what cheeses have come in that week and we were told a cracking Young Buck Blue Cheese from County Down had just come in and was a must try for any cheese fan. This creamy, raw milk cheese had a fantastic lingering flavour and was polished off with a glass of Portuguese red. Richmond is one of those places you can bring your mates, your mam or even your gran and they will enjoy not only the food but the homely atmosphere they have manged to harness so quickly. Our server on the night Trish was another highlight of the evening for us and having come from Frankie Mellon’s An Port Mor we would say she is sorely missed. Some people love what they do and are born to customer face Trish is one of them and could give many in the industry a lesson in hospitality. Wilde has chosen his team extremely well, and the atmosphere on the night we dined was infectious, with a combination of sterling food and top quality service after only a month of trading Richmond, much like it’s regenerating street, has a very bright future ahead, get in now while you can. Our bill, excluding service came to €167 for four. This is a Standout Taste we would highly recommend.